Drive up to Mt. Soledad. Be rewarded with some of the best views in America. Breathtaking. Tranquil. Romantic. Soul inspiring. The entrance to this incredible spot is in a swank area of La Jolla. But don't worry, the experience is totally free. Grab a picnic lunch and take a drive up to the top of this tall 823 foot hill. It's a winding thrill unto itself. The pinnacle is the Mt. Soledad Veterans Memorial where the landmark icon is the 43 foot tall (counting the base) white cross . It stand tall proudly beckoning tourists from around the world. Gaze the 360 degree panoramic views across San Diego County. South to the San Diego skyline, the beaches of La Jolla, Coronado Island and beyond to Mexico. West to the horizons of the Pacific Ocean and the La Jolla shores. North to the University of California at San Diego, Torrey Pines cliffs and its golf course. East to the mountains and valleys that surround San Diego. On a clear day, the expanse seems never ending. The Mt. Soledad Memorial is surrounded by a grassy park. Spread a blanket on the grass or sit on benches that line the edge of the park and absorb the scenes. Or descend into nature walkways for a little stroll through native chaparral and scurrying wildlife. Mt. Soledad is a commemorative to our veterans. Either veterans still living or deceased. Among six concentric walls of memory are 3,200 black granite plaques purchased by donors and engraved with the names, photos and stories of each military war veteran. There are still plaques available. The Mt. Soledad Veterans Memorial honors veterans who have served our country to preserve the freedoms we enjoy. Mt. Soledad is a popular cycling destination. Cycle enthusiasts flock here for the picturesque views and the diversity of 14 unique bicycling trails, each with a differing slope difficulty and length. The steep climbs make for some exciting downhill plunges. Ride your own bike or consider a tour company that will drive you up the hill and rent you a bike to ride down the hill. See this Wikipedia page that describes each trail and its location. has been a subject of continuous litigation. Opponents charge that the cross is illegal on public land since it is a religious symbol and violates the separation of church and state. It has made its way through lower courts and appeal courts with a combination of victories and loses for both sides. 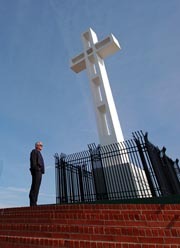 The latest status since this article was written in 2011 is that the 9th Circuit of the US Circuit Court of Appeals ruled the cross is a sign of government favoring religion since it is on public land. However, the court did not order the cross to be removed, but instead returned the case to federal court in San Diego to determine wether the cross must be removed or can be modified to pass the constitutionality test. The controversy is not likely to be finalized until it reaches the Supreme Court. Mt. Soledad is located between Interstate 5 to the east and the Pacific Ocean to its west in the community of La Jolla CA. To get there, take Torrey Pines Road to Hidden Valley Road and head up the mountain. When Hidden Valley Road intersects with Via Capri turn right and follow Via Capri as it winds its way to the top of the hill. Turn left on Soledad Road and you’ve arrived. You’ll feel like you’re on top of the world!